A 1940's bike messenger wins the big 6-day race. A hard to find B/W film from the 40's. Joe E Brown - AKA "6 Day Bike Rider". The success of a good Hollywood movie is that it has enjoyable entertainment value and tells a good story as well as mirroring the real world. The 6-Day Bike Rider is such a movie. Made and released in 1934 in the heyday of North American six-day bicycle racing boom, it provided the movie going public, who may not have gotten a chance to see a 6-day race, with the opportunity to view the speed, thrills and spills of six-day bicycle racing. Believe it or not there had been a genre of 6-day films that were made in France ("Open All Night" 1924), Germany ("Um eine Nasenlange" by a nose length, 1931) and in Denmark. The 6-Day Bike Rider became a Hollywood and American version of this style. The 6-Day Bike Rider stared the comedian and trick bike specialist Joe E. Brown. Brown was an actor best known for his slap stick vaudeville stunts and his extra large facial orifice, his mouth, in which he would yell two or three times during his show. Basically, this movie is a romance comedy that uses cycling as a backdrop. Cycling is gradually worked into the plot where for the last 20 minutes most of the action takes place on the track. The movie was filmed at the Los Angeles Winter Garden at 615 North Van Ness in Hollywood. This velodrome had been modified from a roller skating rink and thus the corners are deep but not that steep. The timing of the making of this movie was fortuitous as 6-day racing was exploding as a sports and entertainment event on the U.S. west coast in a very big way. Multi-day marathon cycle races had been capturing interest of both racers and fans in California. But the single most important event that launched six-day racing in California was the Los Angeles 1932 Olympics and the trials for the selection of the USA cycling team. 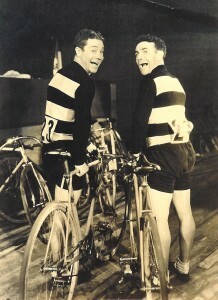 Eddie Testa and Russell Allen were two USA track racers that made the switch to six-day racing. Six-day racing exploded in California with two races in San Francisco, the first in March 11-17, 1934 and the second in May 1934. The first of the Los Angeles six-day races was held in 1932. In 1933 there was a 6-day race that was held from January 8-14, 1933. At present this race has not been recognized as an official six-day event (steps have been initiated to get this race authenticated and into the 6-day record books). The 1933 event was organized by the promoters Lou Daro and Tom Gallery and included some of the top California track racers. Henry "Cocky" O’Brien and Al Rivera won that race. In 1934 there were two six-day races held in Los Angeles. The first took place from June 21- 27, 1934 where the youthful Canadian six-day racing star Lew Rush from Victoria, British Columbia and the Californian Olympian Eddie Testa were victorious. Lew Rush had been on the Canadian Olympic Track Team at the Los Angeles Olympics and had competed against Eddie Testa. Both racers finished outside the medals and turned professional soon after the Olympics finished. The second LA 6-day took place several weeks later from July 12-18, 1934. So let’s flashback to 1934 when Joe E. Brown was a star and the influence of vaudeville on the movies was still significant. 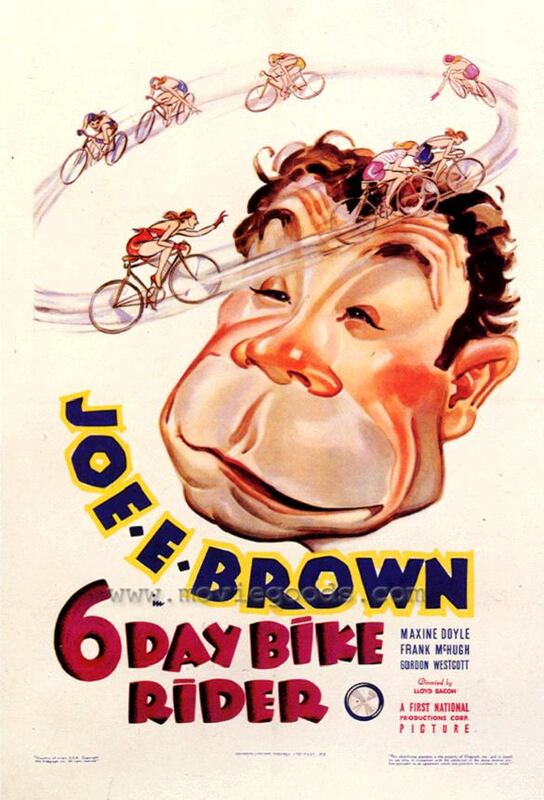 6-Day Bike Rider is a screwball comedy about a yokel, Wilfred Simpson (Joe E. Brown) taking on a slick world-class bike racer called Harry St. Clair (Gordon Westcott) who is after his girl, Phyllis (Maxine Doyle). Wilfred was born and raised in Mildew and works as the local train station manager. The movie is filled with sight gags, corny jokes and bike stunts, all of which attest to Joe E.’s many years in the circus and on the vaudeville stage starting at the age of 10. Joe E. is a nerd but he is great on a bike, so that makes him our nerd. There are seemingly two sets of extras used in the filming of the movie, 70% of which takes place on the track. The slower paced track scenes, where the movie actors are superimposed in front of scenes of the real racers are the scenes that Freddie Schultz is in. Freddie Schultz is particularly visible right behind the star (Joe E. Brown) in the final 15 minutes of the movie. Because of the shirt he is wearing (white with tan looking sleeves, although it’s hard to guess color in a black and white movie)—he is easy to spot because it gives the illusion he has a tank top on as the sleeves are the same value as his arm color. That, coupled with his dark brown hair and the fact I recognize his body language on a bike, makes it easy for me to spot him, particularly if I put the scene into slower motion. There was one rider in particular (Frank Turano) that was a dead ringer for Joe E. Brown, so he acted as his "double". Frank Turano understood better than anyone that an athlete’s job is to be an entertainer. During the decades of his cycling career, Frank competed in 55 Six Day events, worked as a stuntman in the movies, sang, clowned around, and played to the crowd when he raced. As the stunt double for star Joe E. Brown in the 1934 film “The Six Day Bike Race” Frank took the risks, and made it look easy. In one scene the villain of the film, Harry St. Clair (played by Gordon Westcott), was to come out of the north turn and ride the hero right off the upper railing of the track. Mr. Turano broke quite a few bones in the course of his racing career (including a dozen collarbone fractures), but that portly film extra provided enough padding for Frank to walk away from this particular stunt unscathed. For those who would derive unalloyed joy from the spectacle of Joe E. Brown shedding coat, shirt and trousers while pedaling giddily in a racing velodrome, "6-Day Bike Rider" is recommended. The others may find the new offering at the Rialto several laps short of being the perfect comedy. First National has waived the gag rule in this treatment of long-term cycling. The casual onlooker will discover that the studio has not forgotten the historic efficacy, as a laugh-producing instrument, of the cast-off banana peel, of the tumble into a mud puddle, of the whirlwind ride through traffic and of the fall through a trap drum. Each of these old reliables, and others of more or less recent vintage, have been spliced into the film. Still, Mr. Brown has his wide public, as attested by the merry spasms of yesterday's audience, and this following should be pleased to learn that their hero once again is the cavernous-mouthed country boy who makes good in the big city. This time he rises from station agent in sub- rural Mildew to Frank McHugh's team-mate in a six-day bicycle race. Before Mr. Brown is draped with the floral horseshoe of victory, his life-line is crossed by a dastardly rival (Gordon Westcott) and embroidered by a romance (with Maxine Doyle being decidedly offhand as the romantic interest). But he manages, also, to ride as hectic a race as Madison Square Garden has never seen, what with loose floor boards, chloroform, getting his directions mixed and having coffee squirted in his face. But that's the way Mr. Brown does things, and you can take it or leave it. a First National production. At the Rialto.